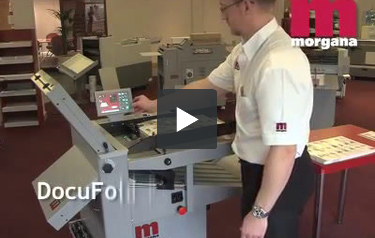 The Morgana DocuFold Pro is a fully automatic paper folding machine, ideal for folding Litho or digital stock. This paper folder will take sheets with dimensions from 6.2" x 5.5" to 26.5" x 14.3" , and will operate at a speed of up to 27,000 sheets (8.5" x 11" Letter Size) per hour. The Morgana DocuFold Pro is equipped with the 7" SmartScreen that enables an operator with minimum training to carry out a variety of folds from an icon driven touch screen. An unlimited alpha numeric memory is available to store all standard and non standard jobs. This paper forlder has a high degree of automation yet simple to operate. Just enter the sheet size and fold type on the DocuFold Pro SmartScreen and the machine automatically adjusts the fold plates and delivery rollers electronically. The DocuFold Pro has a low pressure suction chamber to control curled paper before it enters the fold rollers. The fold rollers will also compensate for most types of fold or paper weight without the need for adjustment, further enhancing the ease of use. Its built-in anti-static brushes assist in the discharge of statically charged print material. For perforating and scoring, its patented plug-in technology enables the operator to quickly and easily set the perforation/scoring unit on the bench prior to use. The features above are just few of the many great features that made the Morgana DocuFold Pro Fully Automatic Paper Folder a top-notch in the paper folding industry today. Fully enclosed fold plates. Fitted with anti-static brushes. Variable speed up to 27,500 sph. Catch tray to collect work for perforating or scoring. Double sheet, and jam detector. Dimensions: L 48.8" x W 21.8" x H 53.9"